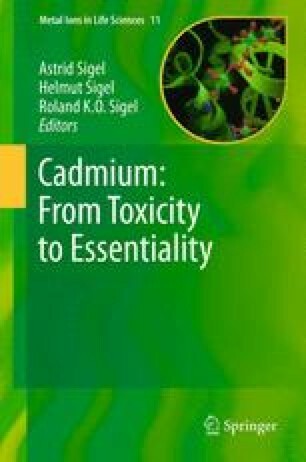 Cadmium is one of the highly toxic transition metals for human beings and is known as a human carcinogen. Once humans are exposed to Cd2+ on a chronic basis, Cd2+ primarily accumulates in the liver and kidney where it forms complexes with small peptides and proteins via sulfhydryl groups. Complexed Cd2+ or the ionic Cd2+ is then taken up by target cells and tissues and exerts the toxicity. However, the question of how non-essential Cd2+ crosses the cell membranes remains unanswered. Furthermore, the molecular mechanism of Cd2+-induced physiological signaling disruption in cells is still not fully elucidated. Investigations of Cd2+ uptake kinetics, distributions, and concentrations in cells require chemical tools for its detection. Because of the easy use and high spatiotemporal resolution, optical imaging using fluorescence microscopy is a well-suited method for monitoring Cd2+ in biological samples. This chapter summarizes design principles of small molecule fluorescent sensors for Cd2+ detection in aqueous solution and their photophysical and metal-binding properties. Also the applications of probes for fluorescence imaging of Cd2+ in a variety of cell types are demonstrated. This work was financially supported by a Grant-in-Aid for Young Scientists (B) (No.17750155 to M.T.) from the Japan Society for the Promotion of Science (JSPS). Agency for Toxic Substances and Disease Registry. Priority List of Hazardous Substances for 2011. http://www.atsdr.cdc.gov/spl/.